Does a “butcher block” glue-up behave like quarter sawn? I'm building a new workbench and bought some maple for the top. I plan to rip the boards into strips and glue the face grains together so that the edge grain is exposed up top. This allows for a very thick tabletop, but I noticed that it also orients the end grain vertically when glueing flat sawn wood. Is that the purpose of the "butcher block" glue up, to simulate and perhaps receive some of the benefits of quarter sawn? Here's a picture if I'm not being clear. Thanks! Grain orientation in a board is all that determines what we refer to as quarter-sawn wood (it isn't always, as the name suggests, about how the wood was sawn1) and if you orient the wood in a glued-up top correctly, so the radial direction is horizontal, that's what you get. When this works out properly the glued-up top you end up with amounts to a large, and often quite thick, quarter-sawn panel (which would be prohibitively expensive to buy as solid wood, if you could even find it). Is that the purpose of the "butcher block" glue up, to simulate and perhaps receive some of the benefits of quarter sawn? The reason this is favoured by some for workbenches with solid-wood tops is that it makes the primary movement direction2 up and down, through the thickness and not across the width as it is more commonly. This can simplify attachment of the top to the leg assemblies or underframe, but mainly it yields a surface that is more stable and less likely to warp. 1 It can be if the log is sawn with this specific intent, but individual pieces show the grain they show regardless of method used, e.g. there is always some quarter-sawn wood produced when you plain saw a log into planks. 2 See image in this previous Answer for radial, tangential and longitudinal grain, which direction does wood expand? and some more info about movement in various species. Not the answer you're looking for? Browse other questions tagged tabletop gluing butcher-block or ask your own question. Type of wood glue-up used in some Ikea furniture? Will PVA glue add some thickness to two and more pieces of plywood? 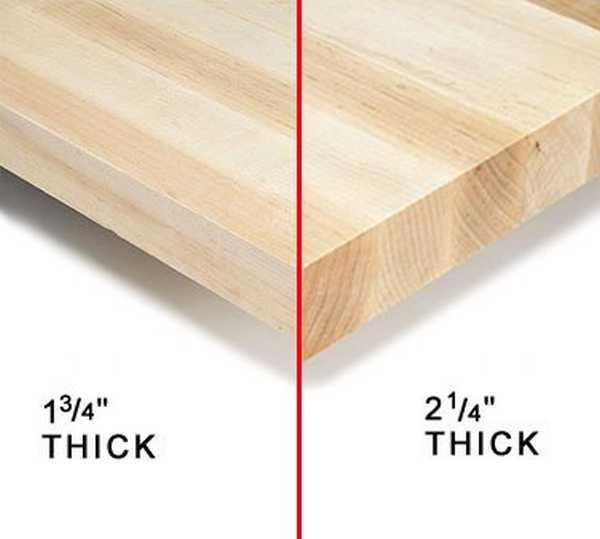 How can I carve out an inset in butcher block? Is it hopeless to glue together two parts of oiled butcher block countertop? Walnut drawer sides: Is it wise to glue-in the plywood base?